Pictured above is a remarkable structure that once dominated the scenery on the northern side of Central Park. 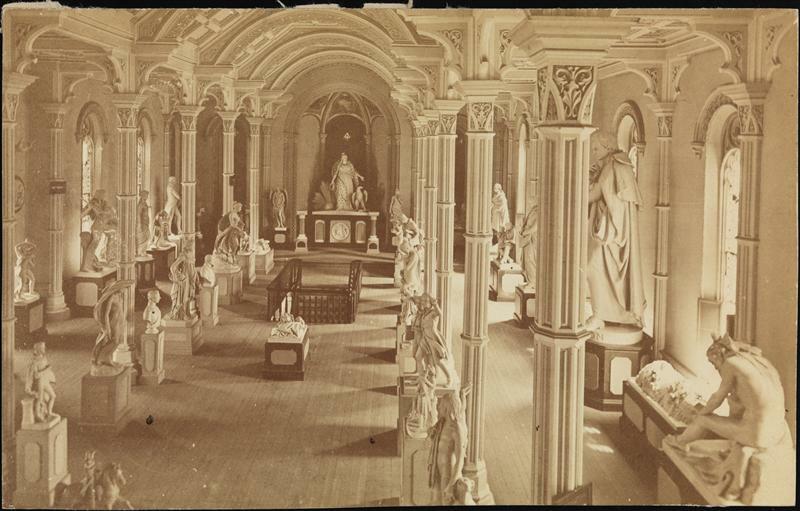 This was the Academy of Saint Vincent on a hill that bore its name. Located on the northern portion of the park, next to the charming Harlem Meer (and nearest 103rd Street), the Academy sat nestled amid a collection of hills and bluffs left over from its original pre-park topography. A narrow passage next to the convent was named McGown’s Pass after Andrew McGown, owner of a popular tavern that sat alongside here called the Black Horse Tavern**. It was through McGown’s Pass that George Washington traveled on September 15, 1776. 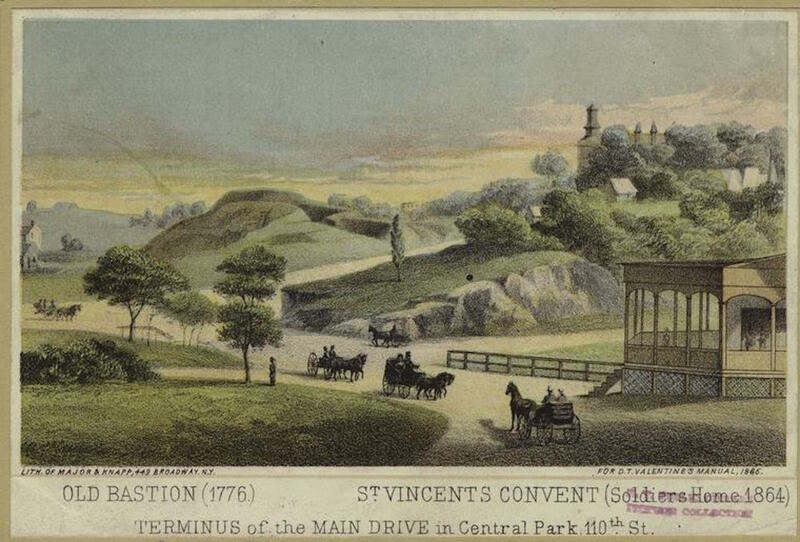 He and a portion of the Continental Army had escaped up to today’s Washington Heights area; when hearing that part of his army had been stopped by the British, Washington rode down the pass and led the remaining troops back up to their fortification in the Heights. He rode back through the pass again seven years later, this time as the victor. 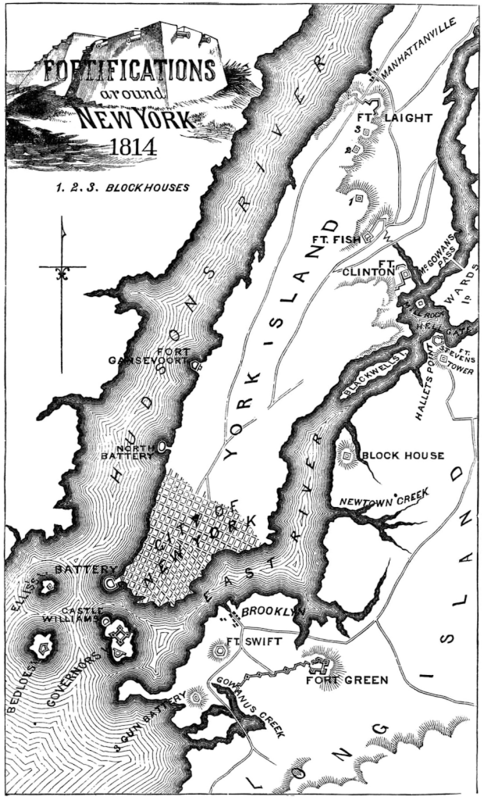 The British and their Hessian mercenaries built forts here to cut Manhattan off from the mainland. Later New Yorkers would seize upon this idea during the early days of the War of 1812. Not willing to become property of the British once again, Manhattan mobilized for any potential battles, building forts all over the island and throughout the harbor. 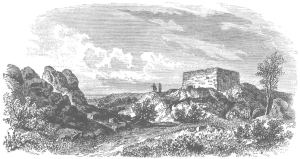 It was here at McGown’s Pass that a couple fortifications were built, including Fort Clinton (not to be confused with the fort in Battery Park, although both were named for DeWitt Clinton) and Fort Fish, named after Major Nicholas Fish, father of the New York senator Hamilton Fish. Nothing much remains of these two old forts, which were never used as the war thankfully never made its way to the city. There are, however, two remaining structures from the early days. A stone ledge overlooking the meer is all that remains of Nutter’s Battery, named after a farmer who owned the property. And nearby stands the Block House, its stone face still fairly solid, once armed with cannons and used to hold ammunition — that were, of course, never needed. The Block House was fairly intact when Frederick Law Olmstead and Calvert Vaux included it in their plans for the new park, incorporating the existing building as a ‘picturesque ruin’ covered in vines. Before there was a park, however, there were nuns. 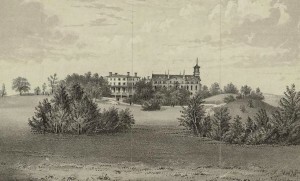 In 1847 the Sisters of Charity of St. Vincent de Paul arrived at the still-bucolic region of Manhattan and opened the Academy of St. Vincent, a school and convent. The nuns left when the area was incorportated into the park, however the building remained standing and utilized for several purposes. 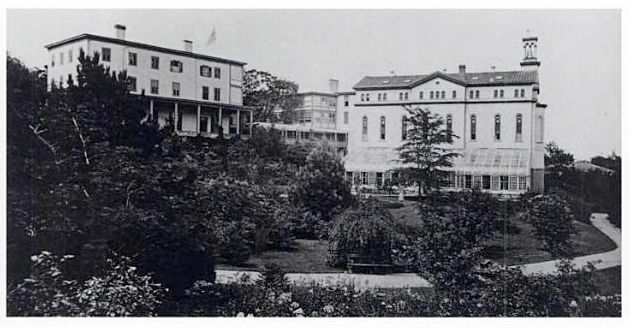 During the Civil War, it was briefly used as a hospital; later, it was a “restaurant and hostelry,” with some certainly spectacular views for guests. 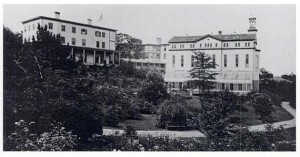 While the convent was gone by the 1880s, the area was not through with McGown or his old tavern. 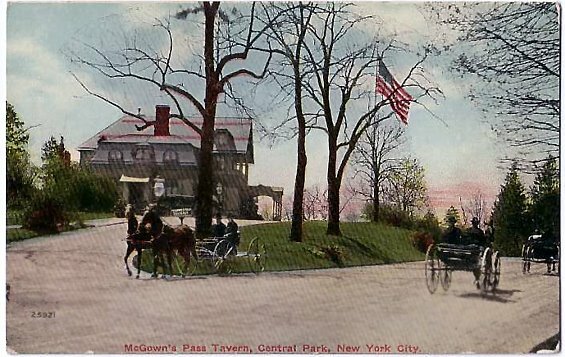 Although the Black Horse Tavern had been torn down decades earlier, a two-story refreshment pavilion was constructed at this site — “heated throughout by steam and lighted with Edison’s incandescent lights” — and later renamed McGown’s Pass Tavern. In 1895, McGown’s was strangely granted its own election district as, being inside the park, it lay outside normal district boundaries. “There were four voters in this territory last year,” declared the New York Times. 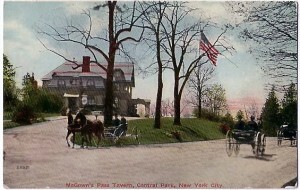 “They are four men employed at McGown’s Pass Tavern.” The tavern was eventually torn down in the late 1910s. This is a bit tangental, but I love this story. A plaque was erected at the old site of Fort Clinton in 1906 and unveiled in a publicized community event for children. It was apparently difficult for some people to find the location and “several chivalrous lads” guided people through the park to the unveiling. ← Have you listened to these 2015 Bowery Boys podcasts yet?